San Francisco State University’s President Leslie E. Wong has announced the donation of a historic $25 million gift from alumnus Chris Larsen (B.S.,'84), his wife Lyna Lam and the Rippleworks foundation to the College of Business, establishing the Chris Larsen and Lyna Lam Funds for the College of Business. This generous gift, one of the largest the University has ever received, will heighten the College of Business’s ability to respond to shifts within the business sector, and to prepare students to become tomorrow’s business innovators and entrepreneurs. In honor of the donors’ generosity, SF State will plan to name the College of Business the Lam Family College of Business, pending approval from the California State University Board of Trustees. A large portion of the Lam-Larsen/Rippleworks gift was made with the digital asset, XRP, the first digital asset donation in SF State’s history, and one of the largest gifts made in a digital asset in the U.S. to a university. Chris and his wife, Lyna Lam, whose two sisters and several other family members attended the University, have been stalwart supporters of the University since 2001. In addition to the $25 million gift to the College of Business, they have donated more than $800,000 to scholarships, education, science and business initiatives over the past 18 years. Chris and Lyna have been stalwart supporters of the University since 2001. They have donated more than $800,000 to scholarships, education, science and business initiatives throughout the University, including establishing the Chris Larsen Scholarship Fund in the Graduate College of Education, and supporting initiatives in the Biology department in the College of Science and Engineering. Chris was named Alumnus of the Year by SF State in 2004. 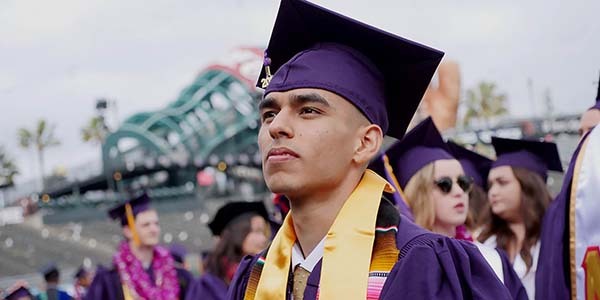 Many students at San Francisco State University are the first in their families to attend college, courageously working toward bachelor’s degrees in the hopes of raising their earning potential. But today, it can take more than a degree to prepare for a successful career. Businesses need to be dynamic to meet the challenges of rapidly changing markets, and are increasingly looking for employees that can demonstrate creativity, ingenuity,resourcefulness, perseverance and the ability to work well with others. As an angel investor, serial entrepreneur and co-founder and CEO of several innovative companies, Chris Larsen is acutely aware of the value these skills bring to finance and enterprise. He too was the first generation in his family to attend college. His father was an airline mechanic in San Jose, and Chris’ initial impulse was to study aeronautics at San Jose State University. When he discovered a passion for business, Chris transferred to SF State, graduating in 1984 with a B.S. in accounting and business administration—majors which he chose because he saw them as practical. After graduating, Chris worked at Chevron as a financial auditor. While the job was a good one, it wasn’t until later, when he enrolled at the Stanford Graduate School of Business, that he connected to his true calling as an entrepreneur. There he studied with Jim Collins, a renowned entrepreneurship expert who encouraged his students to strategically approach risk and “cut the life boats.” This still resonates with Chris, who has built a career on boldly pursuing transformative business ideas. After graduating from Stanford in 1991, Chris co-founded E-Loan, where he focused on democratizing lending and finance, a theme that would reoccur throughout much of his career. Chris was also a key proponent of the “open-access to credit scores” movement while at E-Loan. Chris’ next endeavor was a company called Prosper, the first peer-to-peer lending marketplace in the United States, which he co-founded in 2005. Prosper was inspired by hui, a traditional Vietnamese form of group lending which Lyna’s family practiced in Asia and in the U.S. after they immigrated from Cambodia. A few months after leaving Prosper in 2012, Chris became a trailblazer in blockchain as the co-founder of Ripple, creating a global decentralized network that uses the digital asset XRP to facilitate payments across boundaries and financial systems. In 2015, he and Doug Galen, an entrepreneur and lecturer at the Stanford Graduate School of Business co-founded Rippleworks, a nonprofit foundation that supports high-growth social ventures around the world. Doug and Chris’ belief that entrepreneurs are everywhere, but the opportunities to realize their potential is not always evenly distributed, informs their work. It also inspired the gift to SF State’s College of Business, which will provide opportunities to diverse students in learning business innovation, global enterprise, fintech and entrepreneurship. Chris believes that SF State’s students benefit from their location in San Francisco, which is a high-profile hub for technology and finance. “SF State students have great potential because of their position. Most of the world is outside of this ecosystem, and they’re really trying to catch up,” says Chris. “Being here in San Francisco gives SF State’s students amazing career opportunities. These funds are focused on guiding these students in becoming innovators, entrepreneurs and leaders, enabling them to become changemakers in business and their communities,” says Chris. The Chris Larsen and Lyna Lam Funds for the College of Business permanently endows two new faculty chairs, The Rippleworks Endowed Chair for Innovation & Entrepreneurship andthe Lam-Larsen Endowed Chair in Financial Technology, which will elevate SF State’s focus on innovation-oriented learning and professional development—such as entrepreneurship, commercial incubation, financial technologies and digital currencies. The Rippleworks Chair will be instrumental in inspiring and guiding SF State students in pursuing innovative careers in emerging markets, entrepreneurship and social entrepreneurship. Doug Galen, Ripplework’s co-founder and CEO, is enthusiastic about the potential impact of the foundation’s gift. "We believe that many of the world's toughestchallenges will be solved by innovative solutions led by inspiring entrepreneurs. We are proud to create the Rippleworks Chair as a direct investment in the high-potential future leaders that are in San Francisco State’s diverse community." The Lam-Larsen Endowed Chair in Financial Technology will focus on research and learning at the intersection of finance, data science, and technology. “Being here in San Francisco gives SF State’s students amazing career opportunities. 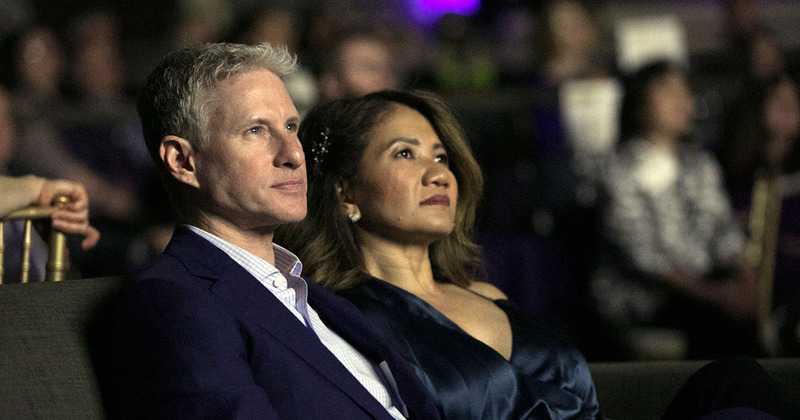 These funds are focused on guiding these students in becoming innovators, entrepreneurs and leaders, enabling them to become changemakers in business and their communities,” says Chris, pictured here with wife Lyna Lam.